You might be tempted to lose that pregnancy weight with the latest trendy diet or burn out that fat at a gym. But the most important guideline is to keep it slow and not rush! Your body has undergone drastic changes in the last nine months. So give it some time to recover. In normal pregnancy, one can start exercises after the first post natal checkup which is after six weeks of delivery. If you have had a C-section, then you'll have to wait till your surgery and your stitches completely heal. Initially, you might find it difficult to have time for exercise in your daily routine. Begin with ten minute workout sessions daily and slowly increase the duration. Here are few tips to keep in mind on your journey to your goal. To avoid stress and anxiety that come with slow weight loss, check your weight only once a week. Do not do heavy workouts of high intensity after a short period of delivery. It may increase your vaginal flow. 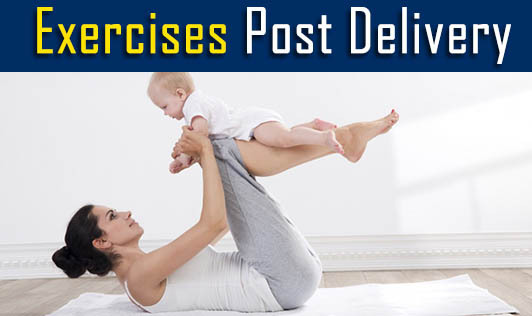 Prefer doing exercises after expressing milk or feeding your baby. Exercising with full breast may make you feel uncomfortable. Use sports bra over your nursing bra for extra support. Do not cut down on calories with the intention to lose weight fast. Eat a healthy, well balanced diet during the first few months of breast feeding. Ask your dietitian to help you. Get massages frequently to relax your muscles and feel rejuvenated. The good news is that with exercise and diet, you are most likely to reach your normal weight within a year.